The landscaping of your home is the focal point of its exterior. A great graded and manicured lawn, a well-fitted walkway, seasonal plantings, and depth-creating retaining walls can all work to improve the appeal and value of your home. However, it’s important to make sure these two elements work together, the “soft” living elements and the “hard” construction and stone elements. Understanding and balancing soft and hard landscaping is the key to a great home and landscape design. Hardscape is defined as the man-made features of landscape architecture, such as walls or pathways. Hardscape is the constructed part of your landscape: it is nonliving parts of your landscape design that are generally designed to either retain parts of your property, such as retaining walls; provide access, such as walkways or patios; or add additional features, such as pools or outdoor kitchens. Softscape is defined as the living horticultural aspects of landscape architecture, such as grass, trees, and flowers. While hardscape can provide comfort and access while outside, it doesn’t hold a monopoly on beauty. Grass, trees, soil, and plantings all provide the land part of your landscape, the natural beauty which the hardscape allows access to. They cool your backyard, provide a safe space for fun, and help with natural events like water flow. Planned Use: One of the biggest factors is the use of your area. If this is backyard for children and pets, a large green area provides a safe place. If it’s an outdoor area for employees, walkways and benches can help make it a place to relax. Overall Aesthetic: A wild yard and a backyard completely covered in stonework are both examples of extremes. Find where you want to balance the structure of hardscaping with the natural beauty of softscaping. Maintenance & Water Conservation: A combination of patios, walkways, and drought resistance plants can provide a low maintenance, drought friendly area. Water Flow: Unless done right, much of hardscape is water impermeable, which can lead to pooling and flooding. Correct design and balance can allow hardscape water to flow into softscape designed to absorb that water, especially useful for driveways and parking lots. 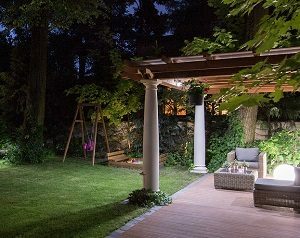 As mentioned throughout this article, the most important work done balancing your landscape’s hard and soft components is during the design phase of any project. If you’re looking at making dramatic changes to your landscape, it’s always a good idea to consult with a landscaping contractor for them to give you some ideas of the implications of these changes. Here at Greener Horizon, we’re landscape design professionals, using traditional walkthroughs and sketches alongside powerful 3D modeling programs. Contact us to get started on your next project, or get a head start by signing up for a complimentary consultation.